Some of the mysterious grooves on the surface of Mars' moon Phobos are the result of debris ejected by impacts eventually falling back onto the surface to form linear chains of craters, according to a new study. 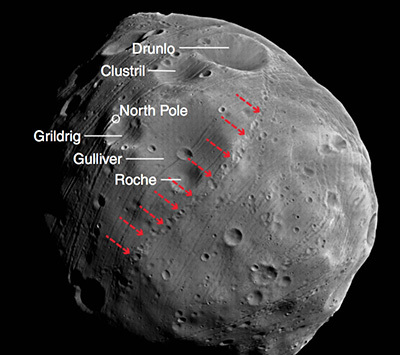 One set of grooves on Phobos are thought to be stress fractures resulting from the tidal pull of Mars. The new study, published August 30 in Nature Communications, addresses another set of grooves that do not fit that explanation. This work was supported by NASA and the Department of Defense through a National Defense Science and Engineering Graduate Fellowship.